Depression impacts all of us at one time or another. It isn’t logical to expect that everything will go well all the time. Plenty of men may seem to be very lucky and prosperous. They may even appear to have the world at their fingertips. Sadly, that surface appearance may mean absolutely nothing to somebody suffering with symptoms of low motivation and/or depression. Depression can hit you like a ton of bricks. The stigma associated with being a man with symptoms of depression can be demoralizing and add insult to injury. Most men have no desire to admit their feelings of depression let alone confront or deal with the associated issues. It’s safe to assume that before you try and tackle a problem you attempt to understand what at its core. Preparing yourself for your battle is the safest way to assure success in whatever it is you are trying to overcome. It’s important for men to understand that feelings of depression do not diminish their masculinity in any way, shape or form. Everything may be going right in their life and they may have no reason to be upset or sad. Unfortunately, depression in men does not need to be correlated to any personal or external circumstance or situation. With age, testosterone production decreases causing our endocrine system to have to work harder in other areas. In turn, additional stresses in the physiological production of regulated hormones can cause feelings of depression. When testosterone levels in men are low, many other functions in the body are hindered by the lower secreted amounts of the hormone. Low testosterone causes feelings of fatigue and lag, as well as reducing motivation and vigor. The end result is a once strong and inspired man is now tired and in need of rest and recharge. This demoralizing realization can be emotionally devastating to a man. 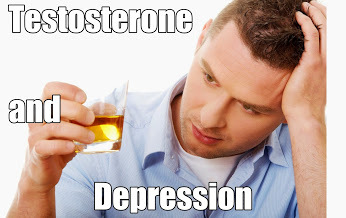 This means, not only are there physical attributes associated with low testosterone and feelings of depression, but also functional and emotional declines associated with hypogonadism. This combination helps to further and fuel the feelings of an emotional downward spiral. Life is too short and beautiful to waste. Make sure to contact us to help you take another approach to reviving your emotional engine. Don’t resign yourself to taking libido deteriorating antidepressant medication that has been scientifically proven to cause an array of unfortunate side affects over long term use. Fix the problem at the core, don’t mask it. Call us today in order for one of our Wellness Advisors to help you understand further how AAI Rejuvenation Clinic is going to help you regain control of your well being.